Yesterday the Norvell men completed our first ever bike camping experience, a 62 mile round trip adventure. Ever since I started riding my bike full-time (for reader clarification: my family owns a van, but we try to bike as much as possible. and we dont get paid to pedal) I have been thinking of ways to integrate bicycling more and more into the life of our family. We bike to church, to school, to work, to the grocery store, to the park, to the lake, we bike with a canoe on a trailer, I've hauled supplies for my hammock post from Home Depot on my bike, & etc. But we have yet to bike to camp. We love to camp (for reader clarification: I and my kids love to camp, my lovely and amazing and wonderful and highly perceptive bride is learning to love to camp) but to camp we load up the van and drive to a state park. For the record Minnesota has some amazing state parks. 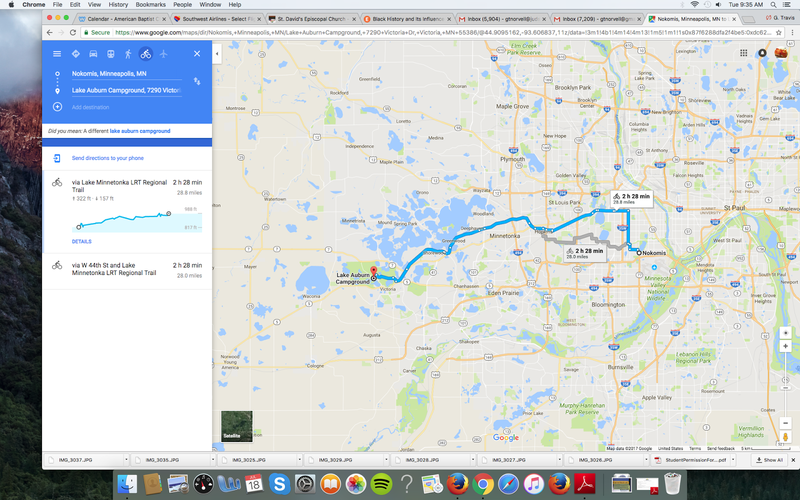 The state parks, for the most part are a good distance from Minneapolis. So where to ride bikes for a camping experience? Here comes the fantastic Three Rivers Parks District and the Carver Reserve Park with the Lake Auburn Campground. Because our dog is experiencing separation anxiety only the boys and I went on this trip. I wanted the boys to have a good experience so I loaded all the gear onto my bike trailer (the bike trailer is the former trailer that used to haul the kiddos in years ago. I stripped it down and put a plywood base on it) so the boys would only have to pedal themselves to the destination. We loaded up the trailer with too much gear and began pedaling. And here is the beauty of this trip: 98% of the trip was done on bike trails! Along Minnehaha Creek, onto the Cedar Lake Trail to Hopkins then the Minnetonka Regional Trail to the Campground. Now how did I get a 14 year old and 11 year old agree to pedal 31 miles to a campground? I lied and I bribed them of course. First, I told them it was only 20 miles. When we passed the 20 mile mark I told them you can never trust google maps. Second, I filled them with treats along the way. The first stop was the Hopkins Depot. This was our first time at the Depot; human do I feel like a sucker for not stopping there before - what a cool spot. What's not to love about coffee, donuts, youth run organization, bikes, solar panels, trains, a garden and grills? What in the world are serious grills doing out there? I dunno, but I can see a biking and grilling event in the near future. Then we just kept pedaling. Reader, note that once you start pedaling on the MRT it turns into an aggregated path rather than a paved path; which means compacted dirt and gravel. It will slow you down, but wont pop your tires. I was taken aback by how many churches lined the trail. This one, St. David's especially caught my attention. Come on, St. David's you should have a welcome bikers, hikers, walkers, explorers sign on the path with worship/prayer/meditation times. I visited their website only to discover that the rector spent significant time in God's chosen state, West Virginia, therefore my critique of St. David's ends here. And we just kept pedaling. Every time we came to one of those Three Rivers Parks kiosks with the poles pointing directions I would point something out so not to alert the boys of the mileage to the camp. This sign near Shoreview indicating there were 8 miles to go (when I told the boys it was just a little farther) could have ruined the trip but luckily the boys never saw it. We reached our site around 7pm after being chased and tormented by mosquitoes and horse flies and some kind of smallish horsefly. The bugs...they were serious. After claiming a site, setting up hammocks, securing firewood and checking out the surroundings we cooled off in Lake Auburn then it was the usual camping experience: brats, smores (with jumbo marshmallows, there is a Lunds & Byerlys right on the path in Hopkins) time by the fire and card games. Now is the time to ask why didn't we stay at the bicycle only camping spot? The boys sure did want to know! Well it was simple, there was a RV near the bike camping spot with a generator and I didn't want to listen to it run all night. Next time, we probably will stay at the bike site. Here is my only request for the bike camping site: how about some chairs. It is hard to pack camp chairs for a bike camping experience, some heavy duty outdoor chairs by the fire ring (and maybe a sheltered coin-operated massage chair). Great idea, plus it is only $10/tent. The moon was only a quarter full, the sky was clear, & the stars were everywhere; so were the fireflies (a spectacle we rarely see in the city). I awoke around 5am to the sun beginning to rise and the birds chirping. It is amazing how only 30 miles west can transport you from the sounds of the city to the silence of the woods which creates habitat for all kinds of birds. I loved listening to the waves of different birds until around 7am. Around the 7 the boys awoke and were, of course, hungry. But I had only planned on a one night trip. So we took the camp down, loaded up the trailer and pedaled back to Minneapolis. On the way we stopped at Cafe 318 for breakfast. I apologize to the owner I am sure we stunk the place up with a toxic combination of body odor, campfire, bug repellent, and camp smell. Then we kept pedaling with plenty of rest breaks and tom foolery. As we neared Minneapolis I pulled over to adjust the bags on the trailer at Lilac Park in St. Louis Park. As you can tell the boys were starting to feel it. I had no idea the beehive was a grill. Or that there were several roadside parks along Highway 100, "Lilac Way." We had roadside parks in West Virginia, I kind of forgot about them. Roadside parks, now turned into biketrailside parks. I like this. But why dont they open up the beehive for grilling again? It would be nice to pedal to the park, grill a couple of brats when the lilacs are in bloom, I'd do it. As we neared home, the boys cooled off in a sprinkler at the Lake Harriet Bandshell. Next time: two days minimum, whole family, fishing gear, better bug plan, camp chairs (unless the park provides them), bike camping site, and telescope. A couple weeks ago the family and I drove out to Portland, OR for the American Baptist Biennial (I know try to contain your excitement). I was excited to visit the west coast, see the ocean again (still aint as cold at Lake Superior), see the Rockies and Cascades and Coastal mountains, sip some Pinot Noir, eat some Tillamook cheese, and etc. But the real reason I was excited about going to Portland was to investigate the bicycling scene. Thanks to the wonders of the internet I have been able to learn some of Portland's bike scene via the Bike Portland page. But I knew I would need to get on a bike and ride around the city to get a full sense of things. Sad to say all of my time was accounted for and did not allow for a city investigation (however, I did get on a Biketown bike and set a record!). Nevertheless, I did notice a few things that make me think, "Minneapolis/St. Paul we should be pedaling circles around Portland." 1. We're relatively flat. Portland has all kinds of hills and stuff that make you sweat and wear your brakes our fast. 2. We have dedicate bike lanes and biking infrastructure. Many lanes in Portland had a bike symbol on them but no space at all for a bicycle and a car. Our bikes lanes, our bikes lanes, our bike lanes! 3. Did I mention the MSP area is flat and easy to cycle? 4. Minnesota Nice, use the passive aggressive culture to our advantage. I watched bicyclists after bicyclists get cussed at, yelled at and swerved at in Portland. Sure drivers are aggressive here in MSP, but mostly they internalize their anger and let it simmer for generations. It was great and inspiring to see so many people cycling in Portland, there is no reason MSP cant get to double digit riders. We have the flat surfaces, the infrastructure, the niceness, and lots of biking institutional structure. Come on Twin City-ans.